The Proceedings do not record crimes in London alone. Until 1834, the jurisdiction of the court at the Old Bailey extended to the whole of rural Middlesex; and from that date onwards added a more broadly defined metropolitan area. As a result, for the first 160 years of the Proceedings a substantial number of crimes from rural parishes such as Enfield and Hornsey, Ruislip and Islington can be found. After 1834, the court's jurisdiction expanded to include crimes tried both north and south of the Thames, including parts of Essex, Kent and Surrey which were still rural. As a result, the Proceedings reflect the small communities and rural lifestyles of southern England just as fully as they record the infractions and behaviours of London's unruly crowds. 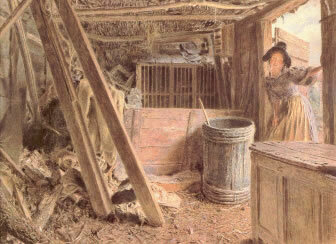 William Henry Hunt, ‘The Outhouse’ (1838). © Fitzwilliam Museum, Cambridge. The economy London's hinterlands was dominated by the needs of the capital. Market gardening and commercial agriculture provided the life blood of parishes which were along the river and within easy walking distance of the hungry markets of London. Each morning a stream of market women, baskets upon their heads, would wend their way to the Fleet Market, Leadenhall, and Covent Garden, while the Thames carried an even heavier traffic of goods from Chelsea and Twickenham. Similarly, nurseries for decorative plants and flowers were also located in these areas. The seasonal nature of these activities ensured that even the most apparently rural of parishes played host to a constantly moving population of agricultural workers. These same parishes, along with more remote corners of Middlesex, also provided the raw materials for building the capital. Gravel pits and brick works in places such as Kensington and Hackney kept a large number of casual workers employed. And the constant demand for grain and hay for keeping and fattening the livestock brought to London from Scotland and East Anglia provided a ready outlet for more traditional agricultural products. Indeed, while the centres of London and Westminster were profoundly urban, like all early modern towns they were deeply intertwined with their immediate hinterlands, and those hinterlands, rural Middlesex in particular, were profoundly involved with the town. Even as rural market gardeners made their way into the City, many urbanites were wending their way into the countryside. The small communities circling the capital became pleasure resorts for both the poor and the rich, and drew crowds of Londoners out into the fields most Sunday afternoons. Around the turn of the eighteenth century Ned Ward famously described his walk to Islington, but a century later even the more sober Francis Place, late in life, recalled with unstinting joy the pleasures of walking to Highgate and Hampstead. They were not alone. Sticky buns and ginger cakes, tea and stronger drinks helped ensure the enduring popularity of shops and pleasure resorts in Hackney, Islington and Highgate. Most of the larger villages a couple of miles away from the built up area of London could boast a range of hostelries and substantial coaching inns that catered for London's perambulating masses. During the nineteenth century these rural diversions became more sophisticated and more commercialised. After the coming of the railways, day trips to the country and the seaside became a commonplace Saturday diversion for all classes; bringing with it all the commercial and economic paraphernalia of modern tourism. But many followed in their footsteps, so that by the early nineteenth century, even before the advent of the railway, long strips of semi-urban development had long since crept their way deep into the country. By the 1830s the semi-rural world around London had come to take on an entirely new and unfamiliar character. Authors such as Daniel Lysons in his Environs of London (1829) struggled to understand and record this new world with just as much fervour as authors such as Dickens sought to understand its more classically urban counterpart. Once the railways made long distance commuting more attractive, new rows of ever more suburban dwellings transformed once agricultural communities into dormitory suburbs. With the advent of workmen’s fares from 1864 onwards, this initially elite suburban flight became a much more socially mixed suburban flood. Detail from Bacon's New Large-Scale Ordinance Atlas of London and Suburbs (c.1912), from Ann Saunders, ed, The A to Z of Edwardian London (2007), p.108. This suburban development was not fuelled by individuals alone. There were also large numbers of institutions which came to own or use buildings sited in the countryside. The Foundling Hospital sent all of its children to nurse in the healthier country districts of Middlesex, Essex, Hertfordshire, Surrey and Kent. And many of the Livery companies bought land in the countryside for their almshouses. Aske's Hospital in Hoxton is only the most famous example. But the Livery companies were not alone. Private mad houses and workhouses created from the 1730s onwards were frequently sited in semi-urban villages on London’s periphery. At Islington and Hoxton, in particular, by the end of the eighteenth century every other house seems to have been occupied by notoriously greedy poor law contractors. During the nineteenth century this pauper invasion was replaced by a more genteel, if no less institutionalised form. Private schools, frequently built on much older charitable foundations, grew to monopolise ever more green space for their exclusive pupils – turning the green fields of London's rural hinterland into the playing fields of Eton and Harrow. The agricultural and yet suburban and changing nature of the environs of London had a profound impact on the variety of crimes committed and tried at the Old Bailey. 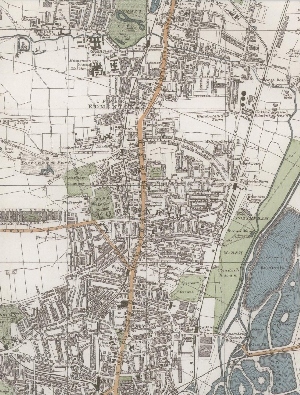 Looking at a parish such as Enfield, for instance, for any period in the eighteenth or early nineteenth century, will expose cases involving animal theft, highway robbery, and the theft of agricultural products such as hay; and victims and defendants whose occupations are given as farmers, wheelwrights and market gardeners. By the end of the nineteenth century, under the pressure of a changing population, Enfield's crimes changed dramatically. They now involved none of these occupations, and the victims and defendants were replaced with bricklayers, shopkeepers, boot closers, accountants and venetian blind makers. These changes are epitomised in the story of highway robbery. In the eighteenth century the roads of Middlesex, the new turnpikes and older throughways, were the favourite haunts of highway robbers. These criminals, who, until the eighteenth century grew sceptical, enjoyed an enviable position in the affections of the broader populace, made substantial use of the quiet rural districts around London, and frequently found themselves charged and convicted at the Old Bailey. By the early nineteenth century, owing to improvements in roads, policing, and methods of transporting money, these criminals were largely gone – with the exception of a single incident in 1877, no case of highway robbery was tried at the Old Bailey after 1830. And in this later instance, when, wearing masks, Thomas Hyslope and James Dinham (who had been reading a pamphlet entitled '''Claude Duval, the Dashing Highwayman''') robbed the coach bound William Hodgeson in a lonely gravel pit on Blackheath, declaring theatrically, "Your money, or I'll fire"; Hodgeson at first assumed his attackers were simply drunk, and ordered the coachman to drive on. You can search for place names by using the Personal Details search page or keyword searching.